Survival and understanding how outdoor gear developed is at the heart of Mike and I’s research and also our personal experience. The original title of Invisible on Everest: Innovation and the Gear Makers (2003) was ‘Surviving the Snows’. We were writing about the history of mountaineering and polar exploration from the perspective of the gear that was used and the innovators who developed it. We quickly realised that wet, whether from within or from outside, was the major cause of chilling and possible hypothermia. My survival wasn’t threatened by getting wet without a hood, in 1978. But it might have done. Luckily I soon learned and also bought a better jacket! Mary:When I started walking in the hills, 40 years ago, I didn’t always wear my hood when it rained or snowed. I hated my head feeling enclosed and not being able to see where I was going. My cheap jacket had a poorly designed hood which meant I often didn’t use it. 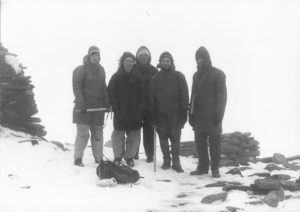 The photo on the left on the top of Dow Crag, in the winter of 1978, shows me looking rather bedraggled. Of course my hair got wet, and so did my clothes, as the rain and melted snow dripped down my neck, so I was often chilled and uncomfortable, especially if there was wind as well as rain or snow. puts the extent of her father’s legacy for mountain physiology into perspective. 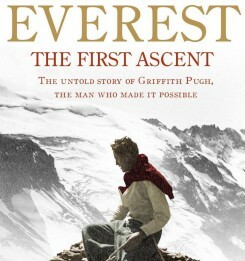 Pugh was the ‘invisible hand’ behind the 1953 Mount Everest expedition. His scientific knowledge in all matters to do with equipping the expedition, its nutrition, food packaging, hydration, acclimatization and use of oxygen was vital. He was undoubtedly the unsung hero and deserves considerable credit for the expedition’s success. In the 1960’s, prompted by some fatalities in the Peak District, Pugh undertook some research which showed that the combination of wind and rain could significantly reduce the thermal properties of clothing. He proposed improved survival equipment and this led to significant changes in understanding and practice. Use of orange survival bags became standard practice and his findings led to the innovation of the KISU (Karrimor Instructor Survival Unit) by Ken Ledward in the 1970’s. Our forthcoming book Keeping Dry and Staying Warm shows how ‘on-the-hill’ performance of waterproofs is heavily influenced by the skill of the user in layering techniques and forward planning for weather and terrain. We show the importance of early recognition of physiological changes and adverse heat loss mechanisms and the importance of experience building.